Identification of flycatchers can be hard. Really hard. But now that we’re warmed up with all those yellow, black and white flycatchers, let’s look at some really hard birds: the infamous Empidonax genus, the “Emps.” Because after you’ve done Emps, nothing will seem as hard. In Alaska, at least. the commonest Emp is the Hammond’s Flycatcher. We’ll start there. All Empids are drab. All have pale eye rings and wing bars. 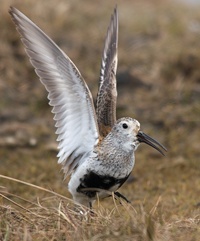 Identification depends on subtle differences in voice, size, bill shape, the extent their primary wing feathers project beyond the tail, and tail length. Hammond’s Flycatcher, Empidonax hammondii, is small with a disproportionately large head, an almond-shaped eye ring and grayish head and paler gray throat. The bill is tiny, like a kinglet. Good luck with that. It’s a handsome little bird, and a bug-eating machine. Hammond’s have been netted and their stomachs pumped: hundreds of insects of many, many species. A generalist. They take bugs in flight, usually from a perch to which they often return. WC has had them hunt mosquitoes just a few feet from his head. Bless their little hearts. Hammond’s winter along both coats of Mexico and Central America; a few in southern Florida. They are among the earliest-arriving flycatchers. There’s some concern that climate change and attendant earlier spring bug hatches will goof up their migration schedule. But for now, the populations are in good shape.